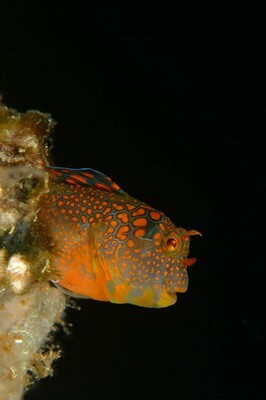 Tesselated Blenny underneath the HI-576A Offshore Platform. These blennies make their homes in dead barnacle shells and can almost always be found on the offshore platforms. This fish would make an ideal aquarium specimen. Shot with the Fuji S2pro using the Nikkor 70-180 Micro Zoom with a +1 diopter. The camera was set to manual f16 @ 1/125th Dual flashes and side lighting were used to create the dramatic effect. For underwater supermacro (this fish is 1/2″ across) sometimes it is necessary to use manual focus – this was one of those dives. Surge and low light conditions meant that I had to hold the manual focus knob with one hand, and snap the photo with the other hand – all while hovering underneath an offshore platform in 400 feet of water.